Since we began making our carpet bags back in the 1970s, we’ve been about trendiness and individuality... but not of the kind that goes out of fashion as quickly as it went in. 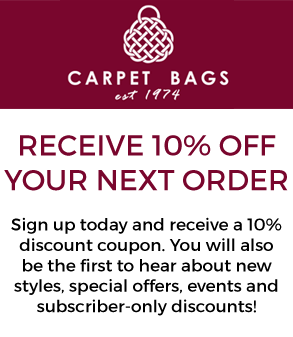 Yes, we like to think we’re pretty fashion-forward – you only need to glance at our first-ever LOOKBOOK to see that, featuring stunning photos of model Anne-Charlotte Fleury – but the range of trendy handbags online that you can find here at Carpet Bags isn’t quite your standard catwalk fare. Our own style icons, after all, aren’t mere ‘here today, gone tomorrow’ types. They’re legends like Mary Poppins and Phileas Fogg, who live on in notions of the ‘best of British’ across the world. The carpet bags with which they remain irrevocably associated aren’t exactly Johnny-come-lately fashion staples, either. They’ve been around since at least the 19th century, when they were first popularised in Europe and the United States, and it seems that we’ve all been a little bit in love with them ever since. So, why purchase a stylish handbag from us? You only need to look at some of our presently available trendy handbags online to see that our idea of ‘trendy’ here at Carpet Bags is also a rather timeless one. Our Lucy handbag, for instance, might represent the perfect blend of the traditional and modern, the former provided by our wide choice of gorgeous carpet fabrics, including the likes of Blackberry, Blue-chiraz, Mosaic, Royal-herat, Sultan and Verda. The Lucy handbag is also lined with a cotton moleskin with two inner open patch pockets, while the frame and rings have an antique brass finish. What about that for a handbag that will still feel ‘in fashion’ this time in a month’s, year’s or even decade’s time? We could cite so many more of our handbags that are sure to attract the admiration of your friends, family and bystanders down the street, precisely because they don’t represent your typical ‘on-trend’ handbag that is ultimately trying too hard to be fashionable. There’s our classically elegant framed Gladstone style bag, for instance, or the Isabella handbag with its leather handle and detachable leather shoulder strap. It doesn’t have to be a handbag, of course – you could alternatively invest in one of our tote bags, rucksacks, satchels, clutches, shoulder bags or purses. All of these bags, after all, offer a similar combination of the finest in British craftsmanship, fabrics, design and timeless style. So, why not take a closer look right now at our broad currently available range of trendy handbags online?